The Regina Folk Festival is gearing up to celebrate its 50th year of music-making this summer, and organizers have lifted the curtain on the event's 2019 lineup. Taking place August 9 to 11 in Victoria Park, the festival's 2019 lineup is topped by Blue Rodeo, A Tribe Called Red and Jason Isbell. 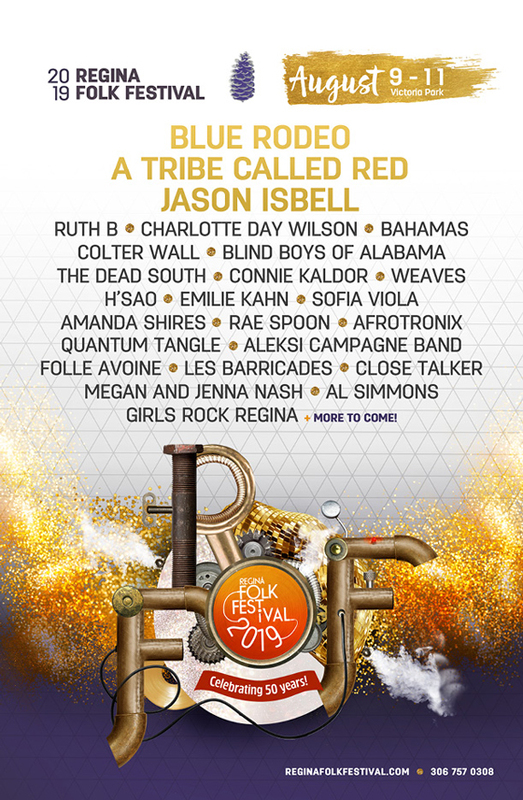 Other festival acts include Ruth B, Charlotte Day Wilson, Bahamas, Colter Wall, Blind Boys of Alabama, the Dead South, Connie Kaldor, Weaves, H'sao, Emilie Kahn, Sofie Viola, Amanda Shires, Rae Spoon and more. Further acts are set to be announced, but you can all currently confirmed artists on the lineup poster above. The fest also promises free daytime concerts, a children's area, daytime beer garden, a festival record store and more. Weekend passes are currently available, while individual night tickets will be available later this spring. You can find further ticketing and festival details here.